But wait, What's an SSL Certificate? If you haven't got an SSL certificate, you really should. Get in touch and we'll see what we can do to get your website up-to-date! For a more in-depth read about becoming fully GDPR compliant read my The GDPR – new data protection regulations and your website article. 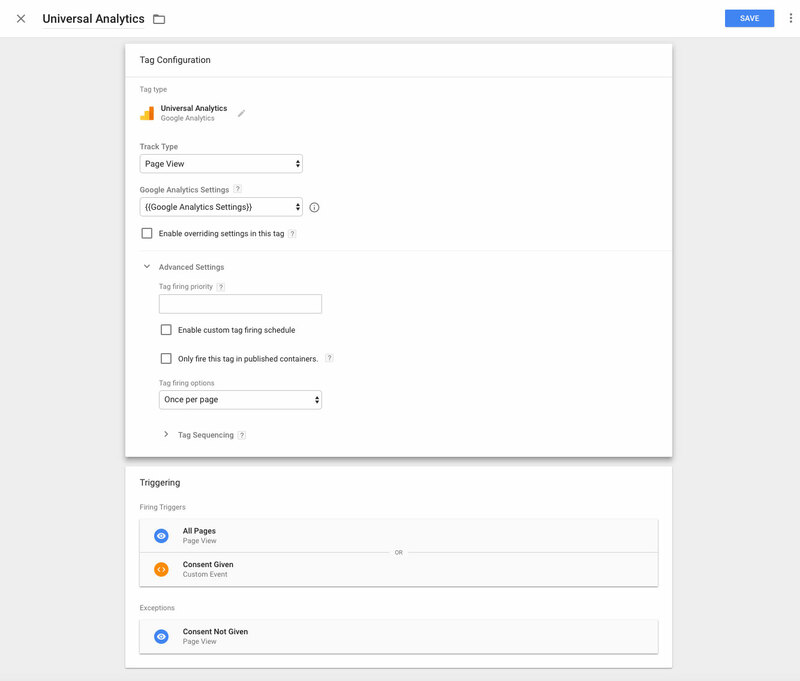 This article is a little lengthly, so you can skip steps 1 - 3 if you already have a Google Tag Manager and Iubenda account. If not, read on. If at anypoint during this article you feel overwhelmed or unsure, please do not hesitate to get in touch. I can implement this into most websites and currently offering this at a 50% discount at £49.95+VAT. If you are interested simply get in touch. Google Tag Manager is a tag management system that allows you to quickly and easily update tags and code snippets on your website or mobile app. Once the Tag Manager snippet has been added to your website or mobile app, you can configure tags via a web-based user interface without having to alter and deploy additional code. This reduces errors and frees you from having to involve a developer whenever you need to make changes. Essentially, once setup you can add code, like marketing scripts, to any page on your website, without ever needing to interact with a developer. 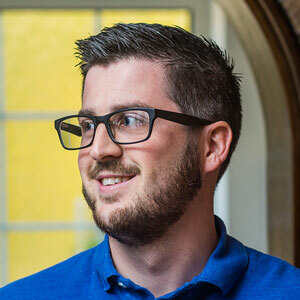 There are of course more advanced and complex implementations, like eCommerce goal tracking, that occasionally need the use of a developer (you're not getting rid us of that easy! 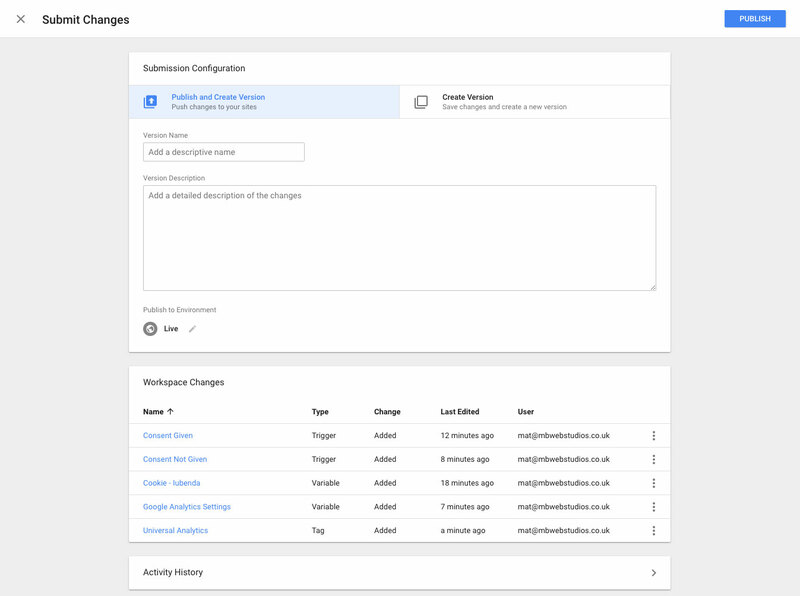 ), however, for a marketing team that doesn't want to be held up with development delays Google Tag Manager is a great solution. We'll use it to listen for a unique event trigger by Iubenda once user consent is given to then trigger our analytics scripts. Using the link below you can get 10% off your first years subscription to Iubenda. Already a MB Web Studios customer? I provide, setup and configure an Iubenda license for all my client websites that I build. If you're interested, why not get in touch? Now, with the introductions out the way, let's get stuck in! But I have a WordPress website like everyone else, what can I do? 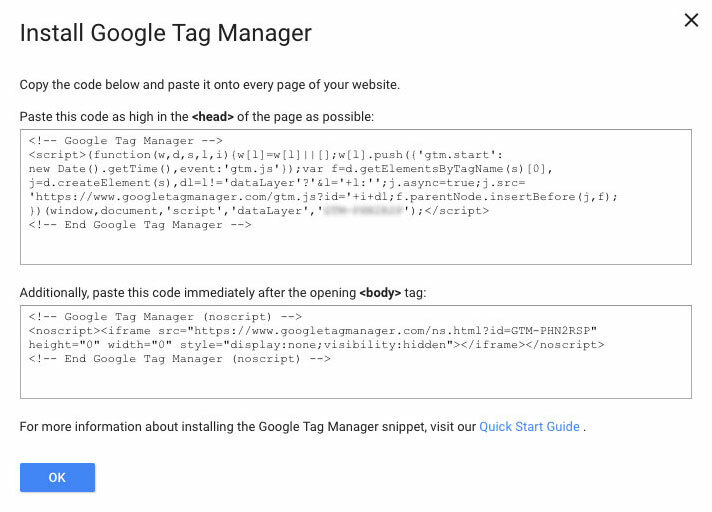 You can read this artice from LunaMetrics on how to install Google Tag Manager on WordPress. Then get in touch I'd be happy to help out as best I can. This might all seem a little overwhelming, however, don't get scared by these code snippet, they really are just a case of copy + paste. Next we need an Iubenda account. Iubenda offer a completely free tier, however, there are some limitations in this where a lot of the "services" are not available for non-pro plans. For a single app/website you're looking at around $27 a year, that's like under £2 a month, so it's not bank breaker! Remember to grab your 10% discount! Iubenda is really intuitive, however, they do also have a great getting started guide if you get stuck. We now need to modify the code to include this new section. This will allow us to create our trigger in Google Tag Manager and tell it the user has "given consent" for cookies to be dropped. You'll need to add this code snippet to every page on your website. Again you may need a developer for this, but if you are using Webflow you can simply paste this into the Project Settings > Custom Code > Footer Code section below the Google Tag Manager script we added in step 2. We then need to select a 1st Party Cookie and fill in the details like below. You'll need to replace the '_iub_cs-XXXXXX' with your cookiePolicyId that can be found in the script in step 3. When you're happy, click Save in the top right. We now need to create our two triggers: Consent Given and Consent Not Given. Select Triggers from the side menu and click New. With both of these triggers created, we can now add our analytics scripts. This is a little out of the scope of this project, however, to get you going let's add your Google Analytics code snippet. Head over to Tags in the side menu and click New. Triggers - we have GA firing on all pages or when consent is given. However, we've added an exception. If consent has previously been denied, the script will not run and cookies not dropped. You'll be met with an overview of the changes and it's good practice to add a version name and description, however, these settings are not required, you can simply press Publish in the top right. Well done for getting this far. There's some complicated sections in there, but the initial setup is the hardest bit. Once it's setup, adding new scripts with these triggers is really simple. And remember, if you get stuck feel free to get in touch and I can implement this for you.